I profiled the badass women (who I seriously idolize) behind some of this year's Golden Globe nominated series for HelloGiggles. Follow the link below to read the post! Favorite Episode - 01X01: "Pilot"
Felicity, created by J.J. Abrams and Matt Reeves, premiered on the WB in 1998 and put Keri Russell on the map, as a high school graduate who makes a momentous last minute decision to attend NYU after learning that the boy she has harbored a secret crush on, Ben, will be attending school there. While her motivation for making such a rash decision seems poor at the outset, it ends up leading to her reclaiming her sense of identity from her parents, who have always expected her to live her life in a particular way. Despite the fact that this show is over 15 years old, the dilemmas that Felicity and her friends face (both lighthearted and heavy) continue to be relatable for current generations. More importantly, it evokes 90s nostalgia in the best way possible. As someone who was in a sorority, Greek holds a very special place in my heart when I look back on my college experience. DVDs of the show were gifted to me by my mom when I first joined my sorority, and provided endless hours of entertainment for my friends and I on lazy Sundays when we were fighting massive hangovers. The show is sweet and the characters lovable. Even if you have no ties to greek life, the show still resonates through the perspective of Rusty, who is completely new to the world, and slowly begins to gain his footing over the course of four seasons. As I’ve written about before, Gilmore Girls was my go-to for motivation to study in college, and even became the subject of my final research paper. I’ve seen the college episodes more times than I can count, and watching them now makes me ridiculously nostalgic for cold rainy winter days holed up in the library with my film notes and a huge cup of coffee. At the time it wasn’t fun as much as it was stressful and required, but from time to time I miss the deadlines and the rush of adrenaline when it came time to get things done. Plus, Gilmore Girls finally comes to Netflix on Oct. 1, so it’s the perfect time to discover the brilliance that is Lorelai and Rory Gilmore if you haven’t already. The Best Years was a Canadian show that ran on ‘Noggin’ during my final year of high school, and quickly became a favorite, as I got ready to head off to college myself. The show is a ‘teen drama’ that chronicles the college life of (former foster kid) Samantha Best, and her friends in Boston. It’s a cheesy take on the college experience, but also will get you psyched about dorm décor and a new roommate, so it’s worth a watch. The follow up to Freaks and Geeks, Undeclared takes the same relatable approach to the trials of high school and applies it to college. The show follows college freshman Steve Karp and his dorm-mates as they embark on one of the greatest experiences of their lives. However, unfortunately for Steve, his lonely and recently divorced father is tagging along for the ride. Like its predecessor, Undeclared features a bunch of actors (including Charlie Hunnam, Seth Rogen, and Jason Segel) in “before they were famous” roles, and is light heartedly entertaining. I was a 90s kid and therefore I was a Boy Meets World kid. As a kid who was never all that into animation and wasn’t allowed to stay up past 8pm on any given night, I generally was drawn to watching daytime reruns of live-action shows, of which Boy Meets World was my favorite. During my high school years as I got more interested in television, I made a diligent effort to go back through the series and make sure I saw every episode. What is special about the show to me is that even now in my early twenties I can watch and enjoy the episodes, recalling just how it felt to be facing my pre-teen years. Because I have had this experience with the show, along with programs like Lizzie McGuire and Even Stevens, I had a hard time seeing that most of the programming that was available to my younger sisters revolved around obtaining and maintaining fame in some way. There really was a lack of shows that dealt with general and relatable childhood experiences. While I was skeptical about the creation of Girl Meets World, I also was hopeful that it might function to fill that void in Disney channel’s lineup, and after watching the pilot of the show multiple times I can honestly say that I believe it does just that. Riley Matthews is just a regular kid. She is young, awkward, and trying to find her own place in the world, just as her dad Cory did on Boy Meets World. Her relationship with her parents is strong, and there is a good level of give-and-take as they encourage her to branch out on her own and “make it her world” without going too far. Her best friend Maya is a troublemaker, but also a victim of circumstance who must lean on Riley and her solid family structure at times (she is also a reminder that a thirteen year old can be significantly cooler than I am). There is a cute boy, a dorky boy and a comedic little brother, but the most important element that carries over from the original is the show’s heart. It presents issues of identity and relationships in a way that will be relatable to a whole new generation of kids who have grown up with a landscape of child pop stars and dogs with blogs. The first episode airs tomorrow night. I truly do hope that this show will be a hit for Disney. I know that I’ll be watching. I was late to jump on the bandwagon with Enlisted, the Fox show created by Kevin Biegel, and for that I am regretful. I let the episodes build up in my Hulu queue while I finished out the seasons of the other shows that I had fallen hopelessly behind on. Then, over the past two days I watched all 13 episodes. Despite my best attempts to not get too attached to the characters (knowing that the show was cancelled by Fox), I became hopelessly involved in the relationship between the Hill brothers, and I am walking away from the show having a much higher standard for storytelling in half hour comedies. Not only is Enlisted perfect in its comedic depiction of family relationships through Pete, Randy, and Derrick Hill, but it also creates a heartwarming and hilarious underdog story about the soldiers in a Rear Detachment unit of the army. The show succeeds on the merit of its story about the oldest Hill brother, Pete (the perfect Army hero) being demoted to the Rear Detachment unit in Florida with his brothers: the sarcastic middle child, Derrick and the emotional, shark-loving Randy. They are joined by the rest of the unit: a colorful cast of quirky characters that rival the ensembles of shows like The Office and Parks and Rec. The series is filled with poignant moments, like when Randy throws Pete a “silent” trailer warming party, or the unit marches in the base parade as the cleanup crew. There are smile inducing hand-on-head “hugs” and great moments of teamwork among the unit. But in the end, what makes Enlisted so strong is its ability to portray a particular group of people in a comedic way without taking away any of the integrity of what they do. Yes, the unit is portrayed as a group of (at times) pathetic soldiers, who in the eyes of the system have “failed”. But on the other hand, the writers of the show always make sure to pepper the episodes with moments that demonstrate the importance of the unit and the hard work that they are doing at home in order to support the troops abroad. While these characters may not be up to par as soldiers, the show effectively portrays them as good people that everyone can relate to in one way or another. I truly hope that Fox (or another network) can see the need to give this perfect little show a little more time to shine, and give it another season. In the past few years Netflix has made binge watching television a trendy thing to do, but the self-proclaimed “hipster” that I am loves to point out that 8 years ago (pre-Netflix Instant) I was watching episode after episode on these circular devices called DVDs and I was obsessed. Because of my obsession, most of the gifts that I received during high school were DVD box sets for various shows that I wanted to completely immerse myself in for weeks at a time. While I enjoy doing the same via Netflix these days, what online streaming doesn’t yet offer are the “Special Features” included with most DVD box sets. We’re talking deleted scenes, commentary, behind the scenes documentaries, quizzes, panels, interviews, and gag reels that enable anyone to become an obsessive fangirl. Therefore, from time to time, I find myself breaking out my trusty old DVDs (that serve as lovely shelf decoration in my apartment btw), and marathoning a show the right way – complete with special feature interludes at the end of each season. In my opinion, this is the best way to enjoy binging a show. So take it from me, sometimes the DVD box-sets are worth the investment! How do you get your dose of special features? I mentioned in my last post that last week was a tough one for TV creatives, who were hearing the fates of their shows. But while last week focused on pilots, I wanted to put a spotlight on some of the current shows that were cancelled to make room for new programming. There has been a lot of talk about the fact that the broadcast networks have a hard time sticking with their half-hour comedies and giving them a chance to really succeed, and I agree. Ratings are important, but there have been success stories for shows that were given a chance to pick up an audience (i.e. The Mindy Project on Fox). At the ABC upfronts earlier this week, where the network presented its new slate, Jimmy Kimmel warned the audience: “Don’t get attached to any of these shows – it’s like adopting a kitten with cancer.” And while I am excited for most of the new shows being broadcast this fall, I’ve chosen one show from each network that was my kitten with cancer this year. I highly recommend giving these shows a binge watch if you haven’t already seen them. Plus, since they’re not coming back next year there is very little commitment involved. Easily my favorite new comedy this year, and one that racked up loads of critical acclaim in the TV world but didn’t rope quite enough viewers. I strongly believe that had it been given the post-Modern Family slot, we would be seeing a season 2, but that’s a mute point now. Created by Emily Halpern and Sarah Haskins, Trophy Wife is the story of a reformed party girl (Malin Akerman) who finds herself caught up in a crazy family after falling in love with and marrying a man (Bradley Whitford) with three manipulative children and two judgmental ex-wives (Marcia Gay Harden and Michaela Watkins). The show is hilarious and sweet, and a perfect showcase for three extremely talented child actors: Albert Tsai, Bailee Madison, and Ryan Lee. Like I’ve said before, I’m a sucker for an unconventional family, and this one is an absolute crack up. I’m always drawn to comedies about parents raising teenage children, and the fact that this one is set in the 90s made it a must-see for me. With the tagline “Putting the F back in fatherhood,” Surviving Jack is a story told by Frankie (Connor Buckley), as he recalls his teenage years being raised by his intimidating, unconventional father (Christopher Meloni), who has never been dealt a problem that he couldn’t solve. While Christopher Meloni (one of my favorite actors) carries the show, the stories that develop between the Dunlevy family: Jack, Frankie, Joanne (Rachael Harris), and Rachel (Claudia Lee) are relatable and hilarious. Jack is a new take on a TV dad, who isn’t completely oblivious or entangling himself unnecessarily in his children’s lives. I’m sad to see this one go when it had so much potential. Every season there is an attempt to make a comedy that has a similar draw to Friends. They very rarely work out, and I believe that this comparison dooms them from the start. However, I love ensemble casts, and I love the demonstrations of friends that are so close that they have no problem walking through your front door whenever they damn well please. Therefore, this show greatly appealed to me. Yes, it’s cheesy, but most comedies are, and if you strip away the halo of perfection from Friends, it was too. FWBL is centered around six 30-something friends who each think the other has it better. There’s the married couple (Kevin Connolly and Majandra Delfino), the engaged couple (Brooklyn Decker and Rick Donald), the divorced one (James Van Der Beek), and the perpetually single one (Zoe Lister Jones), who make up a group of friends that all think the grass is greener on the other side. It’s funny, cheesy, and worth a watch. I’m aware that I’m in the minority of people who love this show, and that’s probably because my love for Sean Hayes blinds me to the issues this comedy had. But once again, I’m drawn to the fact that it’s a show about raising a teenager in an unconventional family model. The show centers on Sean (a gay man), who must figure out how to parent his 14-year-old daughter, who just moved in, while navigating a temperamental new boss at work. He receives help (often times unsolicited) raising his daughter Ellie (Samantha Isler) from his mother (Linda Lavin) and his best friend Liz (Megan Hilty). While his mother always advises as an experienced parent, Liz is always available to be the fun, cool, ‘older sister’ type voice in Ellie’s life. I especially love this dynamic, and think it promotes funny and interesting dialogue about raising a teenage girl in a space that has not been previously explored. I think that the struggles this show faced was in its depiction of the workplace, which always fell a little short. If you follow television news, you know that the networks are currently in the process of making decisions about what their lineup is going to be looking like in the fall. This includes deciding which shows will be coming back, and more importantly, which new shows they’re willing to take a chance on. When it comes to dealing with the major broadcast networks (ABC, NBC, CBS, Fox, and to a certain extent the CW), many pilots will be ordered but only a few will make it on the air. Of those few that do make it, it will be a miracle if more than one gets picked up for a second season. Because of this antiquated ritual that we call “Pilot Season,” pilot episodes of shows are (1) shot long before episode 2 and the rest of the season, and (2) crammed with information and jazzed up to be as flashy and high concept as possible in order to gain the networks’ attention. Therefore, while pilot episodes function to set the tone of the show, they often end up feeling slightly different than the other episodes when you look at a series as a whole. Don’t believe me? Go watch the first episode of your favorite network show again. I’ve seen the pilot of The Newsroom about 10 times, and the power of the opening scene always completely captivates me. Although there are mixed opinions on the series (it’s a love it or hate it kind of situation), I find it to be the most engaging and socially relevant program currently on television. The speech that Will McAvoy (Jeff Daniels) gives to an auditorium of college students (as a response to the question “what makes America the greatest country in the world?”) in the first scene of this episode could practically stand alone as a pilot for the series. It throws everything we need to know about Will (and his relationship to the news that he reports) directly at us, and provides the catalyst for how he will change himself and the news organization that he represents over the course of the series. It’s powerful, it’s clear, and it’s Aaron Sorkin at his best. It may be over 30 years old, but the jokes in the pilot episode of Cheers still hold up today, and make it a stronger comedy than most of the new pilots that will air for the first time this fall. Over time, the show and its characters developed and it became hard to remember a version of Diane who pretentiously told Sam that she’s “not in the habit of talking to bartenders,” but even so, Cheers was always the place where everybody knows your name. As a period piece, Mad Men must build the world of New York City’s advertising industry in the 1960s, and this pilot is so important because it successfully brings us into the world without compromising our ability to relate to the characters. Throughout the episode seemingly insignificant elements force us to remember that although the time period may be different, these characters and their relationships are not exclusive to the 1960s. 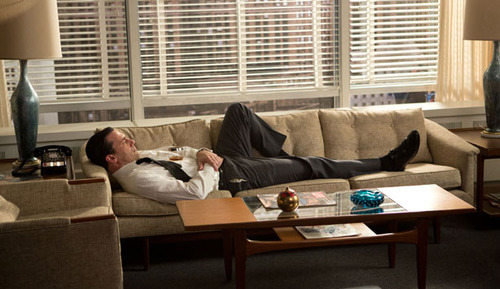 For example, at one point Don (Jon Hamm) lays on the couch in his office and watches a fly caught in the light. Despite the fact that we may not have a couch in our office next to a bar cart full of booze, we’ve all zoned out watching a fly buzzing around a light. Suddenly our world doesn’t seem so different than Don Draper’s. Despite the fact that I’ve recently started to lose interest in New Girl (currently airing its third season), the pilot still stands as one of my all time favorites. It begins with the camera on the face of Jess (Zooey Deschanel), as she describes the typical plot of a horror movie - because, in her mind, her story is kind of like that. The reveal is that her audience is made up of the three guys that will become her future roommates in this quirky, “adorkable” comedy that became an instant hit for Fox. This pilot is particularly successful because of the way that it gives you an in depth understanding of the characters and the reason that they’re friends without too much exposition. Technically speaking, the first episode of House of Cards is not a pilot because Netflix doesn’t abide by the antiquated tradition of pilot season, and gives their shows straight to series orders. However, I wanted to include it as part of this list because the first time I watched it I was completely caught off guard by its unique use of direct address. Frank Underwood (Kevin Spacey) becomes our tour guide in the complicated world of DC politics, looking right at us through the screen, and welcoming us to Washington. With the breakdown of the fourth wall, we become a member of the inside crowd, and exist as part of an exclusive elite group for 13 hours a year (preferably binge watched in one sitting). I am currently available for freelance writing work.